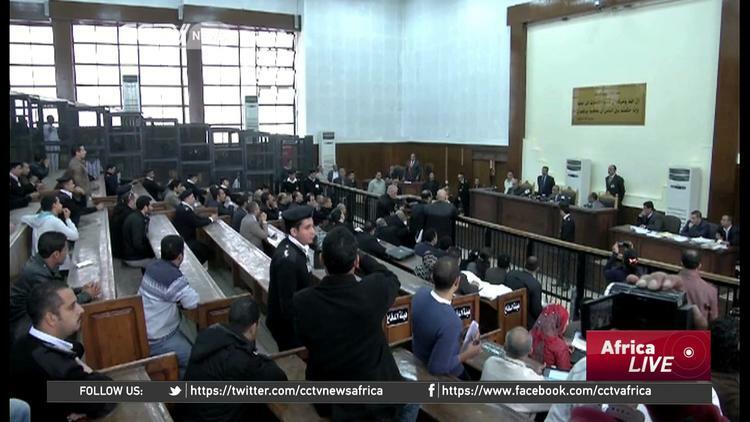 The sentencing of former Egyptian president Mohamed Mursi and a hundred and five others to death for a 2011 prison break and subsequent death sentences handed out to a further sixteen on espionage charges is an illustration of the farcical and politicised nature of the Egyptian judiciary. These are the latest in a string of actions that has seen the institution’s mandate being utilised to curb descent. Despite the minimal probability of these death sentences actually being executed, the consequences are likely to be an increase in militancy and a self-fulfilment of the ‘anti-terrorism’ guise being utilise by the regime to justify the crackdown. Aided in this regard is the lack of a coherent response from the international community, whose actions in recent months have pointed to an acquiescence with the country’s current trajectory. The trial verdicts –Mursi was sentenced to life in prison on the espionage charge as well– were procedurally flawed, defendant’s had irregular access to legal representation, and evidence gathering and cross examination procedures were severely compromised. The glaring fact that the initial arrests were carried out by the former Mubarak regime in early 2011 under emergency law and without detention orders was not considered and so to was the communication between Mursi and an Aljazeera journalist the day of the ‘breakout’ wherein he provided the name, and street address of the prison, asserting that they were not escaping and would remain at the location awaiting government officials responses. The prosecutorial process had been extremely and even laughably shoddy. Of the around seventy Palestinians sentenced, two (Hossam Sanie and Raed El-Attar) had already died –Sanie as far ago as 2008 and Attar, during Israel’s operation ‘pillar of defence’ in 2014, which caused the deaths of over 2000, mostly civilian, Gazans. Another, Hassan Salama, has purportedly been in detention in Israel since 1996 and could not have possibly committed the alleged crimes from inside an Israeli cell. Further in the espionage case, which saw Muslim Brotherhood leaders including Mohamed El-Beltagy and Mohamed Khairet El-Shater receive death sentences, Emad Shahin, a political science professor now based at Georgetown University, who has no real links with the Brotherhood was handed the same censure, and so to was Sondos Assem, a media liaison official employed by Mursi. Although the condemnation of the verdicts have been widespread, with the EU, UN Secretary General and even the U.S. expressing ‘concern’, very little real steps to censure Egypt will be implemented. The EU’s trade and aid funds will be maintained, while the March decision to unfreeze all U.S. military aid to the Egyptian military is unlikely to be reversed –the dozen F16 fighter jets, harpoon missiles and tank kits will be timeously delivered to the Egyptian military. The threat of the Islamic State Group (ISG) and conflicts and Syria and Yemen, combined with Egypt’s geostrategic importance to the region and Israel are likely to supersede any impulses from Western states to change course. It is however improbable that an actual death sentence will be carried out. The Sisi regime is unlikely to risk such an escalation, especially in light of the growth of ISG affiliated groups in the country. These have already begun mocking the restraint exercised by the Brotherhood as ‘subservience’. Two pictures, one illustrating the image of Brotherhood leaders in detention and the other showing ISG members standing next to the body of a dead soldier have been juxtaposed and captioned ‘The might of Jihad versus the subservience of peacefulness .. You choose,’ by the group, while the twitter feed of Dabiq (the group’s Magazine) has already eluded to its slaying of judicial officials in comparison to Brotherhood supporter’s crying over the injustices of the Judiciary. Further, the sentences still have to be sanctioned by the Grand Mufti, who provides a ‘non-binding’ opinion, which is normally complied with; of the 1400 sentenced to death in 2014, less than four hundred death sentences were upheld following the Mufti’s decision, with many individuals being released and others having their sentences commuted to lengthy detention periods. In addition, following this, an appeal process is still possible. In the only trial, that of the Minya trial held in March 2014 where an appeals process has been completed, all thirty-seven defendants whose death sentences were upheld by the Mufti (529 individuals had initially received death sentences in the two day trial), had had this dropped in favour of life sentences. Moreover, it is improbable that Sisi would be in favour of transforming Mursi into a martyr, especially since this would increase his comparative popularity, nor would he seek to exile him to Turkey, as is currently being alleged, unless unbearable pressure is exerted by Saudi Arabia. This is unforeseeable in the short term. The kingdom, despite adopting some measures aimed at détente, still perceives the group, or in least the more coordinated and influential sectors of it, as a threat to its legitimacy. . Sisi is content with the situation as it currently stands, that of an ousted president increasingly falling out of focus and possessing only symbolic influence. He would not want to allow Mursi to become a rallying point, or head a government in exile and thus is likely to work toward maintaining the status quo. The verdict will however led to some Brotherhood members and sympathizers becoming disillusioned with democracy and joining the ISG; it was after the 1950s and 1960s crackdown on the group by the Nasser regime that the formation of more militant groups such as gama’a Islamiyya and Egyptian Islamic Jihad was witnessed. Already this can be observed with the formation of the militant Ansar Bayt Al-Maqdis (ABM). Initially formed to target Israel, the group has subsequently declared allegiance to the ISG and turned its weapons inward. It has to date claimed responsibility for several attacks targeted at Egyptian security and military officials, including an assassination attempt on the former interior minister in September 2013. Noteworthy in this regard is the trial of around two hundred of its alleged members, which unlike the trial and hanging of the Arab Sharkas six, is to be decided by a civilian court. In responses filed by Egyptian intelligence officials, all the defendants are alleged to have resorted to militancy only after Mursi’s overthrow, alluding to the impact that the securitization of politics is having on the country and pointing to its future trajectory. The Sisi regime is currently ensuring a ‘self-fulfilled prophecy’, which is not only detrimental to democracy, but will ensure instability and economic despair remain in Egypt for the foreseeable future. Ebrahim Deen is researcher at the Afro-Middle East Centre (a research institute based in Johannesburg, South Africa). His interests include climate change, political Islam, development studies, and identity politics. He is a frequent commentator on Middle Eastern affairs on South African and international media and is author of the book ‘Hezbollah vs. the Egyptian Muslim Brotherhood: A social democratic perspective, 2012’. He holds a MA in international relations from the University of the Witwatersrand.